Built by the first Tibetan King back to 2nd century AD, Yumbulagang Palace was the first palace in Tibet and also the summer palace for Songtsen Gampo and Princess Wencheng before they moved the capital to Lhasa. Later, this palace was transferred into a Gelugpa monastery during the period of the fifth Dalai Lama. Though the scale of Yumbulagang is small, the three-storied monastery contains towers, chapels and halls. This palace enshrines the sculptures of Nyatri Tsenpo and Songtsen Gampo in traditional dresses. 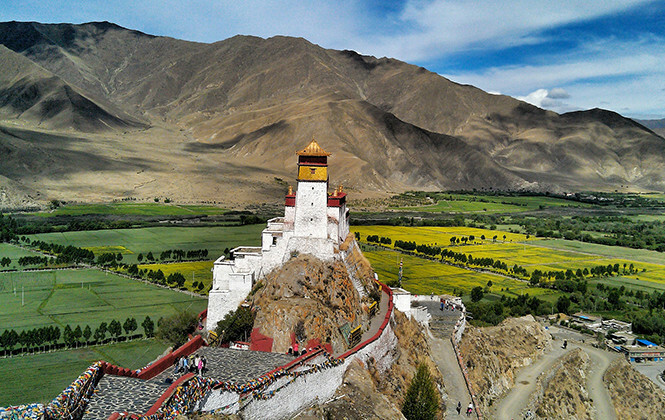 Yumbulagang Palace has great views of Yarlung valley,Tibetan villages and mountains. So it is definitely a nice place to explore. 2.Walk clockwise along the prayer wheels to respect the local customs. 3. One hour is enough for visiting the palace. 4.The Admission Fee is RMB30.